… It’s the DaVinci International Film Festival (DIFF), but also a question most independent filmmakers ask as they browse and filter through hundreds of film festivals online — what makes DIFF stand out from the others? As for our brand, the way we see it, is that Leonardo da Vinci was the epitome of the divergent and creative mind— a luminary— and so we aim to recognize much of the same at our festival. Like many film festivals, we set out to honor the best in independent cinema from around the world, and do so by taking into account the full-scope of creative integration in any given project. From performances to color correction; score to sound design, our Jury is tasked with assessing each film based on an overall cohesiveness as it relates to storytelling. In addition, DIFF shines a [very important] light on screenwriting through its sister-brand, STORYLINE℠ with quarterly and annual competitions. DIFF founders and Board Members are intimately familiar with, and appreciate the full cycle of, independent filmmaking and the demands therein. From perils of financing, through the distribution of any given work — the process is often complex and unforgiving. Most of these creative projects can take a short lifetime to complete, and whether or not your work is showcased at DIFF, we want to encourage you to keep pressing forward. 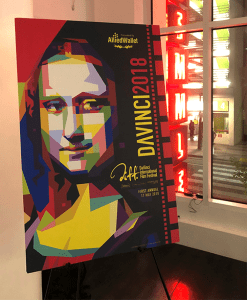 Another standout at DIFF is the DaVinci Film Institute. We are committed to donating a portion of our entry proceeds (per quarter) toward a film grant, that will be awarded at our Live Showcase Event to one duly qualified winner. Learn more about the Institute and apply here. DIFF hosts a QUARTERLY online festival series for all of our categories. Winners of our Vitruvian Award (each quarter) will be invited to showcase at the Live Showcase Event at the end of the calendar year, where they will compete against other quarterly winners for their shot at our most prized commendation, The Leo. Our Inaugural Showcase Event (May 17, 2018), screened films at the Laemmle Theater in Santa Monica for family, friends, and industry professionals, followed by filmmaker Q&A and After Party, where our sponsors presented prestigious awards to our winners. Click here for fest overview and past DIFF winners. We understand that you have many options in festivals, and we appreciate your interest in the DaVinci International Film Festival. If you have any questions, please feel free to contact us. Good luck! Thank you for visiting our website. Come experience the DIFFerence!